If you’re at seed-starting 101 stage, you may feel that growing your own plants is something only sophisticated gardeners can manage. But learning the basics isn’t that hard. My own number 1 rule is not to start too early, or your seedlings will be leggy and overgrown well before you can safely transplant them into your garden. Annuals and vegetables are ideal for beginners. Most perennials are trickier because they need cold treatment before they will start growing. They also take two to three seasons to reach flowering size, so you’ll need lots of patience if you want to grow them. Containers: Use propagation kits (found at garden centers or hardware stores). They include four or six packs, flats and plastic dome lids. You can reuse six-packs, or plastic clam-shell take-out containers, but wash repurposed containers with dish detergent and a little bleach, and poke out some drainage holes if there are none. 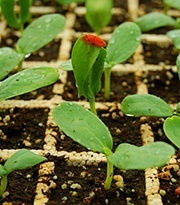 Growing medium: Use sterile seed-starting mixture, not garden soil. Moisten starting mix for an hour or so before sowing: don’t add so much water that it gets overly soggy; it should be moist as a wrung-out sponge. Follow seed packet directions: Most include timing, light, sowing depth, germination and growing temperatures. New seedlings are hard to tell apart, so label containers. Water lightly after sowing: Use a watering can with a fine rose so you don’t wash seeds away. Cover flats with plastic dome lid, or if reusing containers, place inside plastic zip lock bag. When you notice significant germination, remove plastic covers. Watering small seedlings: Water carefully when top of soil mix looks begins to look dry. Don’t over-water: soggy soil can lead to damping off, a fungal disease that kills seedlings. 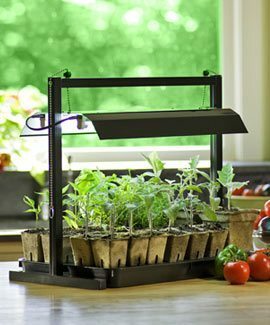 Grow seedlings in good light: A bright window or cool florescent tubes or grow lights will work. Keep florescent light source close to seedlings – about three or four inches (8 to 10 cm) above them. This prevents them from stretching and growing spindly. Use an automatic timer to set lights ‘on’ for 16 hours and ‘off’ for eight hours. Fertilizer: When your baby plants have grown true leaves (the first leaves that appear are called cotyledons or seed leaves), start giving them fertilizer along with watering once a week. A balanced water-soluble 20-20-20 fertilizer at applied at half-strength is ideal. Indoor-grown plants need hardening off for a week or two. Start by setting them outside in a shady, sheltered spot. Give them half days outdoors to begin with, and then gradually leave them out all day. Move them into sunnier and windier areas slowly to get them used to garden conditions. You can harden off cool-season annuals such as pansies and snapdragons several weeks before tender, heat-loving ones such as impatiens or tomatoes. This site will help you estimate the average last frost date in your area. Remember: this is weather, not science. This date can vary from year to year, depending the kind of spring you get. United States: Average first and last frost dates by state. Canada: Average frost dates spring and fall by province. Richters Herbs: Plants, Seeds, More!